Make A Schedule-This sounds obvious and if you're more of a fan of spontaneity then perhaps skip this point. Seriously, having a schedule or editorial calendar to work towards makes things a lot less stressful. I usually make mine towards the end of every month and consult the list of blog posts you see above. I always know The Week goes up on Fridays and then I save monthly favourites for the last week of the month if I can. As well as assigning posts to days, the list above helps me as I can see when I've taken photos (p), written them and the rest as well as check anything extra I may need to do. You get the idea. Schedules are the bomb. Take Pictures In Advance-Unless I'm ridiculously busy or dealing with awful lighting, usually the latter, I always take my pictures well in advance of a post going live. #1 This means I just need to edit them and then insert them into a post. #2 If I decide I don't like pictures, which can happen from time to time, then it means I have enough time to redo them. My pictures usually always get taken on the weekend as I have classes during the week so I'm not home when the natural light is at its best usually. Lists Are Your BFF-As you see above I have that rather snazzy notebook which contains a multitude of lists. There's blog posts, videos, products I'm trialling...even books I am reading just in case I want to feature them. Aside from blog posts, these lists are so helpful when I'm trying products out as I can decide if I want to review things, share them in favourites posts or in worst case scenarios pass them along to a friend. They also help to keep me on track with what I want to test and what needs doing in terms of my blog+YouTube videos. Have A Backup Plan-Be flexible. That sort've contradicts what I've said above but if a post idea just doesn't feel right or isn't working out, don't stress out if you change your mind. Sometimes you may find you don't always have ideas too. Here's where the backup plan comes into play. I have a list of post ideas for when I get stuck that I can fall back on. This could be anything from a tag post, a wishlist. or perhaps just a photo diary. We all get into ruts from time to time so I highly recommend having something like this. Always Keep Your Eyes Open-"Keep watching, because what you see can inspire you." Thanks for the wise words Grace Coddington. In seriousness be mindful of what's happening around you because it can be turned into blog content. Seasonal changes usually inspire beauty trend posts. I recently did one for Spring . If you attended an event you loved (birthday, product launch, a lunch date) or there's a holiday coming up that you could create content around use that to your advantage. Or if you're inclined to enjoy a bit of retail therapy, don't upload an Insta-haul. Save it and you can potentially turn it into another post. I am always brainstormng and thinking of things around me that can potentially turn into new posts. *I hope this post was useful! How do you stay on top of blogging? Loved this post! And the backup plan is such a good shout - I so need to make my own list as it is so easy to get caught short sometimes!! Yay these are my favourite posts! I've been really slack on the blog front lately but I plan on getting organised soon so your tips help a lot! I love scheduling my posts, I use a calendar plugin so I can see when each post is going to go up and keep a list of idea for future posts for when I get stuck, I love lists too! That's a good idea! What plug-in is that Amanda? This is a great post. 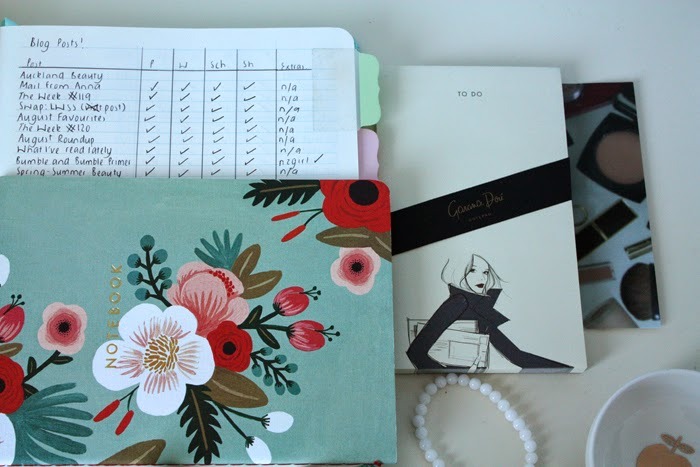 I need to be more organised with blogging - and life in general. I do all my recipe posts in the weekend and photograph them, although it's daylight savings now so the light is pretty good after work. I used google docs for my blog post ideas/schedule for a while, you've inspired me to do that again! It's the wordpress editorial calendar plugin and hands down the best plugin EVER! I'm not sure if there is a blogger version, surely there is? I swear it takes only like a few long days at work or being sick for just a short while to get completely out of all my blog organisation! So frustrating! I am def going to check out this plugin, sounds great! Sounds like you've got it sussed! Idk if you have it on your phone already but Wonderlist is a great listing app that you can use. Lists lists lists for sure! This is good motivation to stay organised! :) Lists are the way to go! Did you end up finding it Laura? Yay, so glad you like it! I don't think I could blog without it!